Peter Peakes Humdrum has been nominated for the Best Animated Short Film at the 72nd Academy Awards (Oscars®). Congratulations to Peter and all the crew on a great achievement, and good luck on the 26th March at Oscar® Night. The film features two bored shadow puppets who play themselves at their own game. Humdrum is Aardman's 7th Oscar® nomination in 9 years. Humdrum has already won several awards at film festivals around the world, such as the Audience Prize, Vila Do Conde Short Film Festival, Portugal, Grand Prix at the New York International Childrens Film Festival, first prize "Childrens Jury Award" at the Chicago International Childrens Film Festival, The Post Office Mclaren Award at the Edinburgh International Film Festival and was nominated for a BAFTA last year. Aardman would like to thank everyone who has supported the studio and this web site over the last few years. Thanks to your support we have been able to negotiate a fantastic deal with DreamWorks SKG for our future feature films. What this deal means is that we can continue to make films the Aardman way but with the enormous support that DreamWorks can provide. As you may already know our first movie Chicken Run will be in the cinemas around the world from June 2000. We will then produce a further 4 films with DreamWorks. The next one tentatively is our interpretation of The Tortoise and the Hare which is in early stages of development. We will continue to make short films, commercials and television series independently from DreamWorks. Once again a sincere thank you from Peter Lord, David Sproxton, Nick Park and all at Aardman. Peter Peakes Humdrum has picked up the "Grande Premio Animacao" and the "Premio da Audiencea" prize at the 7th Vilo de International Short Film Festival in Portugal. The festival ran from July 6th through to the 11th July and screened a selection of the very best short films from all over the world. Peter attended the festival and was at hand to pick up his 2 awards. Humdrum has already won the Grand Prix at the New York International Childrens Film Festival, first prize "Childrens Jury Award" at the Chicago International Childrens Film Festival, The Post Office Mclaren Award at the Edinburgh International Film Festival and was nominated for a BAFTA earlier this year. The film features two bored shadow puppets who play themselves at their own game. We are now deep into production of our first feature film - CHICKEN RUN. The film is being co-directed by Peter Lord and Nick Park and produced at Aardman's studios in Bristol, UK. An animated adventure comedy, CHICKEN RUN is the story of a group of chickens who make a desperate bid for freedom before they can be fried, filleted or fricasseed. Leading the flock are a British chicken named Ginger and an all-American rooster named Rocky. Together they prove that chickens are anything but, as they engage in a daring and spectacular escape. The cast will feature the voices of Mel Gibson, Julia Sawalha, Imelda Staunton, Jane Horrocks, Miranda Richardson and more. The screenplay, by Karey Kirkpatrick and Jack Rosenthal, is based on an original story by Nick Park and Peter Lord. DreamWorks will distribute the film in the United States and in most international territories outside Europe. Pathe will distribute the film in Europe. The film will be released on late June 2000 in UK and US. Worldwide release dates will follow shortly. The first series of Rex the Runt will be broadcast on the Paramount Comedy channel in the UK from May 1st. The programmes will go out at 7.30pm on Saturday and Sunday with two episodes shown each evening. 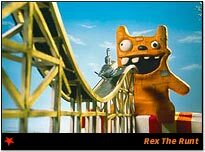 Check out your cable/satellite guide, the official Rex the Runt web site and Paramount's own site at www.paramountcomedy.co.uk. Look out for features in SKY magazine, Maxim and other national press coverage this week. The first Rex merchandise is nearing release  revisit soon for more news. © Copyright 2000 Aardman Animations Ltd. All rights reserved.